2. Cook rice as per package instructions. 3. Meanwhile, remove stalks from mushrooms and place mushrooms on a baking tray. Drizzle mushrooms with a little olive oil and bake in preheated oven for 10 minutes. 4. Toast walnuts in pan over a medium heat for 5 minutes. 5. Wipe the pan clean, drizzle with a little oil and fry the onion for a few minutes until soft. Next add the red pepper, garlic, salt & pepper, and continue to fry for a further 5 minutes. 6. Place cooked rice, toasted walnuts, the fried pepper mix and cheese (leave a little for topping) into a mixing bowl and combine. 7. Remove excess water from the mushroms. Then, using a teaspoon, gently fill each mushroom with the rice mix and sprinkle a little of the leftover cheese on top. 8. 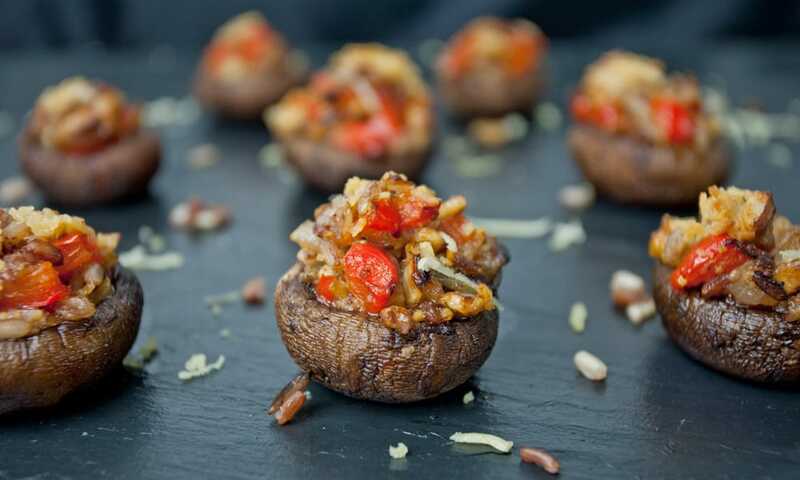 Place stuffed mushroom on baking tray and bake for a further 10 minutes.